CHROMiX Blog - All Things Color Management Colorants (and raves) - CHROMiX Blog: Want to view Lab values in ColorThink? Want to view Lab values in ColorThink? 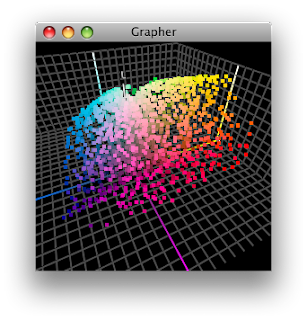 In ColorThink, is there a way to manually enter individual Lab colors and plot them in the 2D or 3D graphs? Substitute the "91 -2 96" with Lab values of your own choosing, tab to create the space between numbers, make the list as long as you like, save it as a text file, and you can drag this file into the grapher or worksheet - and your Lab colors will be displayed. You can also create these simple Lab color lists by bringing an image into the worksheet and clicking on it with the eye dropper tool. A list is automatically populated and you can Save List As... to export a text file or open it in the Grapher. Sharp's Quattron goes to 11!